When assembling terrace heating there some issues of importance. 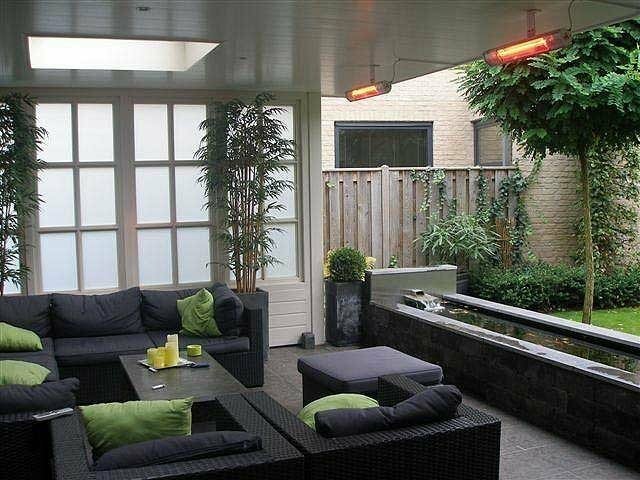 Below we give you some tips for proper installation of your terrace heating. 1. AT WHAT HEIGHT SHOULD BE A PATIO HEATER BE MOUNTED? Of course, we can also reverse this reasoning; Often you are bound to a certain height, for example because the ceiling of a porch is simply that high, or the patio heater must be mounted above a window or patio door. In that case use the capacity mentioned above. However, we recommend a distance of approximately 45 cm between the terrace heating and ceiling because of the heat. The main reason to mount terrace heating at the right height is that the manufacturer had a particular surface in mind when designing the heating. If the surface is increased, the heat will not be sufficient. It can happen that people experience the heating as too intense if the heater is mounted at a lower height. 2. WHAT’S BETTER, WARMTH FROM THE FRONT OR FROM BEHIND? Frontal warmth or warmth from the side is the most pleasant. What do you do when the sun comes out in spring for the first time? You turn your face towards the sun. Sometimes, however, it is not possible (or desirable) to mount terrace heating frontally. Don’t worry about it! 3. HOW MANY PATIO HEATERS DO I NEED? The number of square meters that is indicated on a particular heater is determined by the manufacturer. The manufacturer determines this with the most favorable situation in mind. When using multiple heaters it is advisable to not place them too far apart. This ensures a certain overlap in the heated area. Are you not sure yet? Simplycontact us. Terrace heating is what we do well and we’re happy to advise you. 4. WHAT DO I NEED TO MOUNT MY TERRACE HEATING? All electric heaters in our range are delivered with a wall/ceiling mounting bracket. In standard situations you need nothing more. Sometimes it is desirable to, for example, have the patio heater in a parasol or attached to a windbreak or sun screen. 5. WHAT REQUIREMENTS SHOULD THE ELECTRICAL INSTALLATION MEET? When you a install single 1400 to 2000 Watt terrace heater mounts there are no special precautions necessary. If you would like to install multiple patio heaters or if you have doubts, please read on. A standard home installation has 16A groups. You can connect devices with a total capacity of 3600 Watt to a group like that. If you connect a patio heater to a group where existing devices are connected we advise you to map out the total capability of these devices in advance. Terrace heaters with a very high output evidence a ‘peak current’ when switched on. This peak current is higher than 16A for a fraction of a second. Some installations can not process this peak current and will cause the fuse to burn out. Ask your installer to replace your fuse with a circuit breaker with a what’s called a C-characteristic. These machines are designed for peak voltages. Make use of what’s called a soft start technique to start and/or dim your patio heating. Using Infresco™ soft start controllers prolongs the life of terrace heating by up to 30%. Are you not sure yet? Simply contact us. Terrace heating is what we do well and we’re happy to advise you. Because there’s no ignition, an electric short wave heater is safer than a gas fuelled model. Though one should note that the casing can become warm during long-term use. It is therefore advisable to mount the heater away from flammable items.